"This is the story of the most turbulent time in modern China, seen through the eyes of a young girl. The writing flows like water – quiet but deep. "Born in Beijing, Li was a child through the most cataclysmic events of China's modern history. She was 4 in 1958 when the "Great Leap Forward" attempted to yank China from an agrarian to industrialized economy... 'I am trying to provide people with a window to look into that historic period whithout judgment on my part,' she said. 'That's why I chose to write it from the beginning as a child who could not judge.'" "... this memior offers a highly personal look at China's Cultural Revolution. The author is four years old when Mao initiates the Great Leap Forward in 1958, and she describes the transformation of the family's shared, once lovely courtyard as the neighbors follow orders to erect a brick furnace and feed it all their metals in an attempt to produce iron and steel. Everyone, including the child nattator, willingly cooperates, but the instructions are flawed and everything is ruined. Li effectively builds the climate of fear that accompanies the rise of the Red Guard, while accounts of her headmaster's suicide and the pulping of her father's book collection give a harrowing closeup view of the persecution. Sketches about her grandparents root the narrative within a broader context of Chinese traditions as well as her own family's values, establishing a basis for Li's later portrayal of the individuals around her who respond to oppression with hope and faith in knowledge and education. Black and white family photos reinforce the intimate perspective." " In her engaging memoir of growing up in China, Li tells the story of her family's efforts first to follow with enthusiasm Chairman Mao's dictates and then to comply with them despite disillusionment and fear.... This beautifully written memoir joins a growing body of literature about life in China during the Cultural Revolution. Because the book starts with the Great Leap Forward and extends beyond the end of the Cultural Revolution, it offers a somewhat broader view of a nation in turmoil and illustrates the grit and determination necessary for survival in a dysfunctional society." " From 12 to 22, Moying Li witnessed... city dwellers and intellectuals sent to the countryside for forced farm labor; marauding Red Guards. Her school headmaster hanged himself. But she survives to become one of the first Chinese students to study in the U.S., and now lives in Boston. She tells the story with simple eloquence." "... reading this book, while you recount many dreadful events that happened during the Cultural Revolution, your feelings are not bleak. 'I agree with the Daoist philosophy. The world is like two sides of the same rice paper. While the Cultural Revolution brought pain and suffering, both good and bad happened. We've had 30 years now to mourn and transcend it. Without it China would not have matured. We've been able to distill valuable lessons and go beyond it.'" 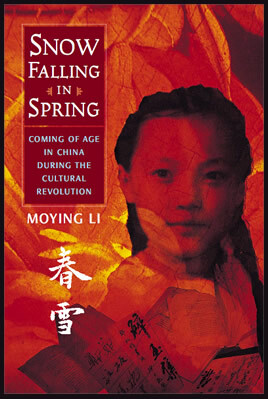 "Snow Falling in Spring joins other important books about the Cultural Revolution... as childhood testimonies to national trauma, cautionary tales for our own time, and appreciations for homes, old and new." "There are many accounts of the Cultural Revolution, which ravaged Chinese society from 1966 to 1976. What sets Li's witness and memory apart is its simplicity, lack of clutter or moralizing. It is almost entirely about relationships... She does not look back in anger." "Li reconstructs her childhood and girlhood through a series of fragile and powerful vignettes: Fragile because the pre-revolutionary China that informs her values and shapes her childhood is obliterated before she is old enough to take her place within it; powerful because Li's family suffers cruelties so arbitrary that they are almost surreal, and are threathened by a savagery wholly indifferent to the familial or the personal. Li's story, though rooted in China, will speak to every young person struggling to realize his or her ambitions, and to every loving family facing hardship or loss. Young readers will appreciate Li's plainspoken style, her restraint, and the clarity with which she describes the unthinkable as well as the beautiful. Adult readers will find much to admire, and will discover not only a poignant story of a vanished world, but a meditation on what parents can and cannot give their children: They cannot guarantee peace or prosperity, they cannot always be present, but as Li puts it, parents can bestow a profound 'sense of direction.'" "The World of young adult literature is rife with shallow troubles and what the singer Ben Folds calls 'unearned unhappiness.' Here is the real thing, a world upended and filled with horrors and viciousness. And yet the story is told without melodrama or pathos; instead, the even tone allows the terror to stand on its own. For many readers a little outside reading would help to place the story in its historical context, but they will be gripped by it either way. At its essence, this is a book about the value of reading-- to escape, to learn, to be sustained and to grow." "This moving memoir begins with the Great Leap Forward when the author is four years old; it concludes at the end of the Cultural Revolution when she is permitted to travel to the United States to study. Li tells of her family's efforts to follow Chairman Mao's dictates through the most turbulent time in modern China. Recounting events without anger or judgment in the voice of the child that she was at that time, Li gives us a book for all ages about the values of family and education, particularly about the refuge that is reading."